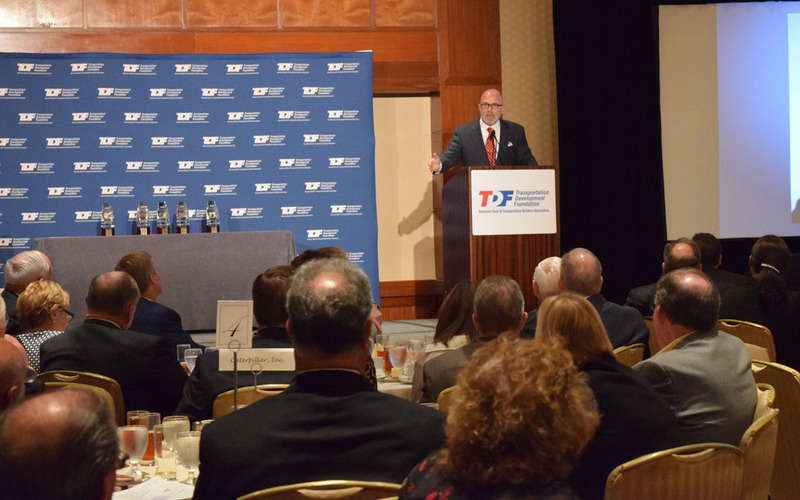 Radio and television host Michael Smerconish believes the polarized media world where he works “is largely to blame” for political gridlock in Washington, D.C.
“The media has become the equivalent of the World Wrestling Foundation,” he told the ARTBA Transportation Development Foundation’s 30th Anniversary Luncheon in Philadelphia Oct. 1. He has succeeded as a moderate, working on both the Fox and MSNBC networks. Smerconish detailed a number of ways that American media and politics have become divided, including the failure of Congress to pass a highway and transit bill and make other infrastructure investment. He said viewers and listeners need to change the dial more often to hear differing views. He supports open primaries, campaign finance reform and redrawing Congressional districts to be less partisan. In the 2016 presidential election, Smerconish said for now it’s “advantage D’s,” mainly because of more participation by women, ethnic and young voters.